FIRE was founded in 1996 by a group of parents who shared a common dream; for their children with special needs to attend their parish schools with siblings and friends. Since that time, through the efforts of parents, a dedicated board of directors, many talented volunteers and community members who embrace inclusive Catholic education, more than $3 million has been granted to partner schools in the Diocese of Kansas City-St. Joseph (MO) to support inclusive Catholic education. FIREBall 2017 – Una Noche Caliente! Underwriting Opportunities and Individual Tickets Available Here! Raffle Tickets Sales Online Here! Get your raffle tickets for a chance to win $1996! That’s the year FIRE was founded. Join friends for a fun and fabulous evening supporting one of your favorite foundations. You’ll be swept away by old-world charm, colorful architecture and vibrant culture. 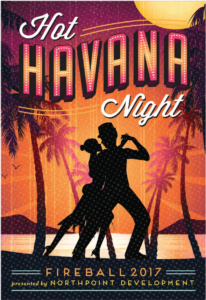 Enjoy delicious Cuban cuisine and exotic libations, cool classic cars, cigars and the sultry sounds of the salsa, merengue, tango and cha-cha-cha!